1974 Ten years of computer and language research by the vision holder starting at the University of Oregon (1964) through a NUL Chevron Fellowship (1966) a NUL IBM Fellowship (1968) a Canadian Federal grant (1971) and an Ontario provincial grant (1974). 1975 Designation of the Universal Language Institute site as being Bahjí du Canada. 1978 Formation of UNCOMMAN Association by 1978 Wintario grant. 1984 UNCOMMAN begins procedure to incorporate federally as UNKOMMON Foundation, a non-profit organization. 1985 1985-08-29 shows in Corporations Canada Federal Corporations Information as as the start of UNKOMMON Foundation Corporation 1973410. This year was also the start of design by Kearns Mancini Architects in Toronto of the building for the Universal Language Institute at Bahjí du Canada. 1986 EDCO (EDucation COmpany) the first ever Western Corporation incorporated in China -incorporated with all earnings to go to the formation of Universal Language Institutes in China. 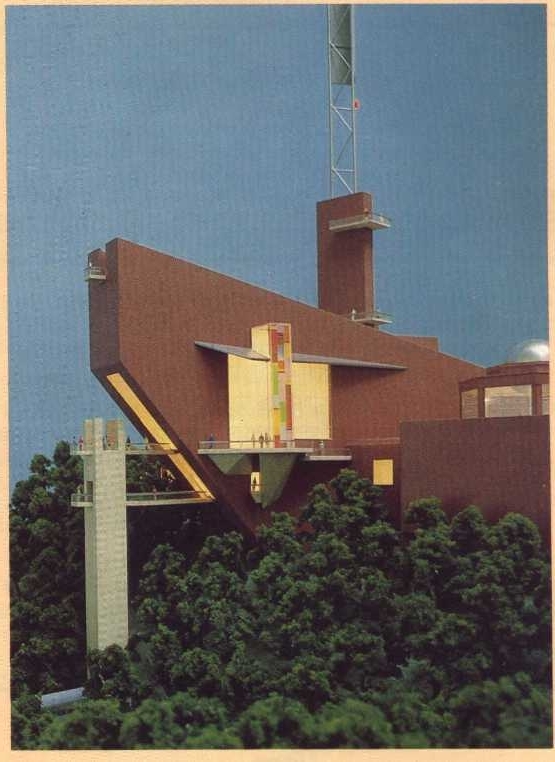 1988 The Universal Language Institute design wins first place award. for Canadian Architecture. 1989 The ACCESS Project begun by the ACCESS Colloquium which consisted of the President of The American Literacy Council, The Director of University Systems for Sperry Rand Corporation, The Director of the Modern Languages Department at the Ontario Institute for Studies in Education at the University of Toronto, The President of the Canadian National Captioning Centre for the deaf, and a number of university professors. 1990 The Canadian Federal Government gave the ACCESS Colloquium an initial grant. In order to cash the grant check the Colloquium had to incorporate and today operates under the style of ACCESS Colloquium Incorporated. 1991 Through the government grant and generous community support amounting to several hundred thousand dollars the ACCESS Project shot thirty hours of Betacam SP video tape. 1992 The ACCESS Project developed the first software for translating scripts into the FXNeTiK spelling used for captioning in the ACCESS System and analyzed and evaluated video editing equipment. The project was delayed by waiting for manufacturers to develop a promised Nonlinear Online Video Editing Lab (NOVEL) technology that was necessary for the completion of the project. 1993 The ACCESS Project obtained use of the first AVID Media Suite Pro sixty-field/thirty- frame per second NOVEL system installed in Canada. This system was installed at the Canadian National Captioning Centre for the deaf, for the purpose of working on the ACCESS Project, and this is where the work continued until May 1995. 1993 also saw the development of the World Language Process concept by the UNKOMMON Foundation and preparation for its decision to use the ACCESS system for this program. 1994 The World Language Process was accepted as a project by the IAEWP (International Association of Educators for World Peace). The IAEWP has been an NGO of the United Nations since 1973 and of UNESCO since 1975. Proposals were sent to twenty-seven provincial governors in Thailand. Each of these governors received a presentation on the World Language Process, under the aegis of the Royal Consulate of Thailand in Canada, while they were in Canada. By the end of 1994 eighteen teaching positions were available in Thailand for WLP teacher volunteers. In December the first hour of the ACCESS videos, consisting of six lessons, along with a drill tape, was completed and delivered to the University of Kansas for evaluation. Also in December a letter was sent to each of the national chancellors in the ninety-one member countries of the IAEWP, inviting them to participate as chancellor for the World Language Process and by December 31st sixteen countries had World Language Process chancellors appointed. 1995 The editing equipment was moved to a video school location and the World Language Process had assigned to it, by the Toronto Municipal Job Incentives Program, for six months, four full time editors. There was a considerable learning curve in learning to use the editing system, in the training of a half dozen editors, and in the development of the icons, formats and standards to be used in the videos. By the end of the year, six hours of video had been edited and the project had trained over 60 people in non-linear editing, nine of which proved capable of actually doing the project. At this time the project lost access to the original editing equipment but the video digitizing boards for another system were donated to the WLP by the AVID Corporation. 1996 There were over sixty volunteers for the overseas teaching program and a total of over 100 program volunteers. There were World Language Process Chancellors in 28 countries and over 100 teacher positions available in four countries.It had been demonstrated that both teacher volunteers and teaching positions were readily available. A 40,000 word simplified dictionary had been scanned in preparation for editing. Item selection had been made for a 4800 word picture dictionary. The first five of ten teacher correspondence lessons had been written. The first four of twenty student workbooks have been written. A layout mockup has been completed for the student workbooks. Arrangement had been made with Project Gutenberg to use its machine readable texts and to store the ACCESS dictionary on their system. 1997 The World Language Process went on the World Wide Web. Because of the Web, The World Language Process, for the first time, achieved a level of over 500 volunteers. With Sally Ward doing most of the data entry, over 80 editors were able to create sentences for the 40,000 definitons in the dictionary and the dictionary data base was implemented. Roz Rus edited the 44,000 words on the Angel spelling list. David Hatch developed and installed the first web on-line Angel Translation program for the web. In September of 1997, Shawn Beilfuss has taken over guidance of the Comic Book Project. 1998 - In the early part of the year, Alex Nauda directed us to the Carnegie Mellon Institute word list, and by mid year there was completed the major effort of merging it with the Rondthaler/Lias list and converting them both to Angel FXNeTiK spelling. By August of 1998 the World Language Process had chancellors in over 30 countries and Sally Ward became the Chancellor Administrator and editor of the Chancellor News letter. In December the editors completed syllabifying 815 merged word list files of fifty words each. Brett Holt wrote an improved Windows 95 program for on-line ANJeL Tun translation which is able to translate to both Angel and NES (New English Spelling). The latter is under the guidance of Ron Footer in London England and is used by the ACCESS project as Bridge English. There were developed a suite of free analyses programs for researchers wishing to do research on the Angel and NES fonetic spelling lists. on our website and archived (among others) LANGO by Robert Robert Craig & Antony Alexander of the Isle of Man. Antony Alexander and Dr. Steve Bett, along with Roslyn Rus, Douglas Worthingham, and some others started reviewing Regularization for the ACCESS System. 2000 Almost the whole of the year 2000 was spent in a gigantic project of supplementing our definition data base with three more dictionaries, one of them being the unabridged Webster's International Dictionary. All three were digitized and checked for order and spelling. A significant effort was made to become an independent NGO member of the United Nations. Our president submitted by the stated deadline the required application on our letterhead, but no response was obtained. We also made a study into using Arabic Characterization for the ANJeL Tun. 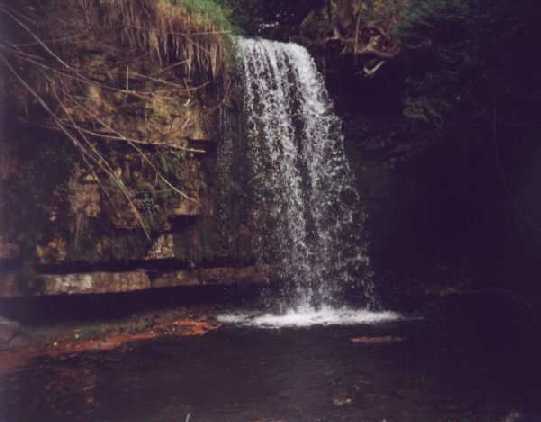 In the fall of the year the Bahjí Memorial was extensively landscape. The placing of the natural red stone was accompanied by a Metis Ceremony conducted by the National Chairman of the Southern Metis. 2001 A follow up phone call regarding our United Nations application determined that it had been received but that because of limited resources due to lack of funding they had not been able to process all the applications. The year 2001 saw a major effort to reorganize our web pages and move them to a new server. The major task in 2001, was to merge all the dictionary data bases into one and to rationalize them with the word lists. 2002 In 2002 at the future site of the Universal Language Institute we had the first annual World Language Process picnic with a tree planting activity to plant 88 new trees. There was attendance from 3 States in the US and 2 Provinces in Canada. We once again did a major reorganization on the web pages and moved them to a still faster server. The major task in 2002, continued to be to merge all the dictionary data bases into one and to rationalize them with the word lists. Two volunteer programmers worked on the project. There was appointed a Chancellor for Japan and a professional paper was presented at the JALT Conference by Professor Jonathan Britten. A major arrangement was made for the placing of volunteers into China and information about that program was incorporated into the web pages. Video editing technology made a considerable advance during the year. Reasonably priced non-linear editing programs with much greater capability became much more available and new video cameras with direct DVD storage capabilities appeared to be on the verge of integration with them. During the year we also began the study of animation capabilities. 2003 In 2003, at the suggestion of Professor Britten, the name World Language Program was changed to the name World Language Process, as being actually more reflective of the process of investigation, research, development - and promotion - of the concept that there should be a universal language and what it should involve - and how it should evolve. Application was made to the 2003 JALT conference for a second presentation about the World Language Process. The ongoing study of animation processes, synthetic generation of voices, TTS (Text To Speech) technology, talking heads and so forth received the assistance of several notable experts. The possibility of cooperation with AT&T in developing videos with VTTS (Visual Text to Speech) technology, for training Chinese personnel for the Olympics in China, was undertaken with the appropriate director at the AT&T Research Laboratories. The World Language Process presence on the web was further extended with its being mirrored at two other North American locations. Both the present web site and one of the new sites have a T1 available and the second North American mirror site has dual T3s. The need for this massive amount of bandwidth was necessitated by its initial Webpal primary site being overwhelmed on two occasions because of demand in connection with catastrophic threats for which it also provides support and response materials. The one occasion saw over 85 thousand hits on in less than 3 hours. Arrangements were made for the distribution of the web site by CD to other parts of the world so that at a future time it may be implemented on websites there. Thousands of CDs were distributed and portions of the web site were mirrored in over 30 locations. In September of 2003 Bo Zhang, the World Language Process Coordinator for China traveled from Toronto to Beijing for the technology conference for the 2008 Olympics and made contact with a number of key officials. In December, Dr. Leibl, President of the WLP; Rae Smith, Vice President; Bo Zhang, China Coordinator; and Bruce Beach, International Coordinator; hosted a dinner in Toronto for the Director of Public relations for Beijing which was reciprocated in Beijing the following June. 2004 In February the IAEWP appointed WLP Coordinator, Bruce Beach, as its liaison and coordinator with the UN NGO Coalition for an International Auxiliary Language. In the spring Anzovin Studios developed animation characters for the ACCESS system and Speech Graphics continued the development of animation capabilities to match up with speech generated graphics. In June Bo Zhang, the WLP Coordinator for China and Bruce Beach, the WLP International Coordinator, traveled from Toronto to the Beijing cultural conference for the 2008 Olympics with a DVD presentation on the UNKOMMON proposal to donate the World Language Process ACCESS system for teaching personnel associated with the 2008 Olympics. A letter of understanding was signed with the Humanistic Olympics Committee for us to provide instruction for ten million Chinese. Professor Britten's paper on the World Language Process published in the fall in the 2004 JALT Journal in Japan. The AT&T Speech Animation Lab closed but both its director and the President of Speech Graphics assisted us in finding another provider. We eventually chose the European Babel Bright Speech from the Acapella Group for TTS and Inovani in Norway as our Speech Animation provider. 2005 The Japan Chancellor of the WLP, Professor Britten was invited to present on the World Language Process at the July 6-9, 2005 Cardiff Conference on Language and Global Communication at Cardiff University in the capitol city of Wales, UK. In preparation for the above conference, a new WLP presentation DVD was developed that incorporated several new technological breakthroughs developed for the WLP by Inovani. The TTS Animated Characters were for the first time able to sing and better pedagogical speech speed control was implemented. The WLP International Coordinator, Bruce Beach and his wife, and a long time WLP activist from the UK, Antony Alexander, traveled to Cardiff to make presentations. A new World Language Process Internet Domain was obtained with the World Language Process name. In December, the Board of Directors of the UNKOMMON Foundation were invited to an International Banquet organized by the Universal Peace Federation and were there individually presented with award certificates recognizing them as "Ambassadors For Peace". 2006 In January we began a test to determine if Brasseur binary coded symbols enhanced script recognition in accordance with split brain theory. It was hypothesized that they would combine the logic processing of symbols on one side with abstract meaning / imaging on the other. WLP began working on the establishment of SIGS. See: (Special Interest Groups). with considerable attention being made to develop links to other sources. See: Discussion. There began at this time an on-going discussion and consultation regarding the development of a statement on the World Language Process development method. August ended the binary coded font test with the determination that uniqueness in symbol appearance is more beneficial than logical formation. WLP researchers unsuccessfully sought to find record of experiments utilizing the speculated TLA (Triggering Learning Algorithm) and ‘UG’ (Universal Grammar) assumed common to all human beings. Several articles and position papers were developed by WLP members and placed on the WLP web site. 2007 February 16-17, Professor Britten made a presentation on the Theme of: "Designing and Developing Teaching English as an International Language According to a World Englishes Paradigm" on behalf of the World Language Process at a conference at the University of San Carlos in Cebu City, Philippines. Extensive effort to define a 'Process Language Syntax' using the guidelines of a universal grammar. 2008 World Language Process conducted a symposium at the AILA (Association Internationale de Linguistique Appliquée - International Association of Applied Linguistics) 2008 15th World Congress of Applied Linguistics held August 24-29, 2008 in Essen, Germany . WLP Presenters were Jonathan Britten, moderator of the WLP session; Antony Alexander; and Bruce Beach. Bruce Beach was appointed as moderator for three other AILA sessions and Jean Beach was also in attendance. There was further research into the Brasseur Script and a Power Point presentation was placed on a DVD by John Seth Sochacki III, a substantial supporter of the WLP. This DVD was given to a number of key individuals and future WLP group members at the AILA Conference. The WLP attendance at the conferences has only been possible because of the often sacrificial contributions by a number of members and supporters. In regards to the latter special mention and appreciation is made here of Clifton and Diane Yocom. The major WLP activity at the AILA 2008 Conference and for WLP in 2008 has been to begin to structure and organize a World Conference of all the nations of the world - and the WLP is presently proposing that it take place at the 2011 AILA Conference in Beijing, China. 2009 The year was one of considerable striving and non-accomplishment. The members of the WLP are astounded at how little interest and support there is in the world for something that could greatly assist world peace and understanding. 2010 After the disappointment in the progress so far, in what has been a centuries long process by a few devoted individuals, we hope that there will be a change in world conciousness out of what appear to be climaxing events of the age. In preparation for this, extensive effort is being made to prepare for a WLP symposium at AILA 2011 in which we are inviting as many of the nations of the world that we can - to participate. We were also notified that the location where the model for the building for the Universal Language Institute had been stored for a quarter of a century - was going to be torn down and that we had until the next summer to find a new location for its storage. 2011 Once again a year of exceptional disappointment. We were emphatically dis-invited in participating at AILA in Beijing. After having attended three international academic linguistic conferences of this kind, with what we feel are dramatic presentations, it still never ceases to astound us how very, very poorly our presentations are attended by linguistic academia while other presenters on the most mundane subjects have large attendance. One positive note. 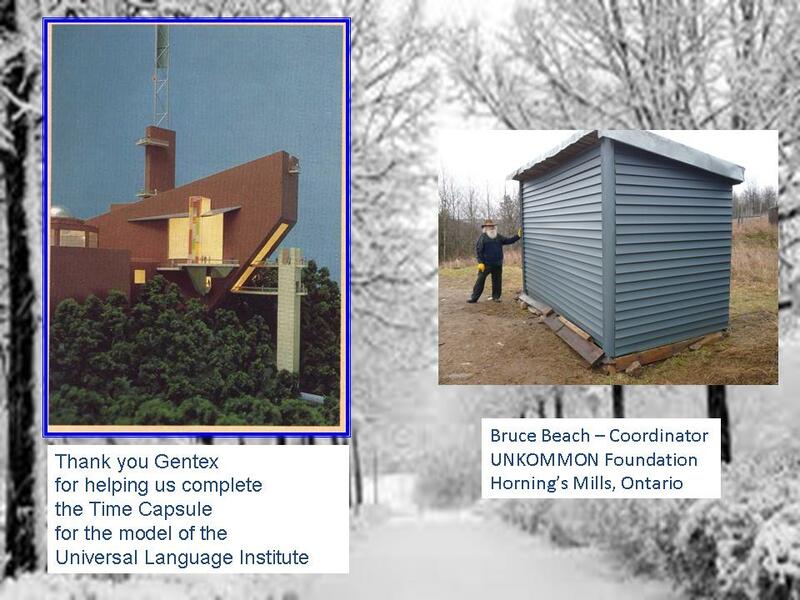 October through December of 2011 saw the building of a loading dock and two Time Capsules for the storage of the model of the building for the Universal Language Institute (and its accompanying displays). (see picture). Five carpenters contributed their time and a number of sources contributed materials. 2012 National Geographic shot a couple of hours of video about the placing of the display into the Time Capsule, but footage only made it briefly into their show in 2012. The Time Capsules await opening until the event of some Global Conference that has the actual interest and momentum to establish world peace and that will be interested in such things as a Universal Auxiliary Language that will contribute to world peace. The plan is to open the Time Capsules at the time of the Global Conference and to take the displays for presentation there. 2012-01-11 was the Date of Continuance on the Certificate of Continuance for UNKOMMON Foundation Corporation Number 197341-0 received from Industry Canada as required of all Non-profits to complete before October 17, 2014. 2013 Intensive effort throughout 2013 in the development of experimental animated speaking characters to work interactively on the Internet with a TINAG program using LERNs and TRIADs to teach a language. 2014 Further development of the TINAG software. By-Laws for UNKOMMON Foundation Corporation Number 197341-0 shown received by Industry Canada / Industry Canada on 2014-08-06 as required of all Non-profits to complete before October 17, 2014.